Rupert Murdoch, (b. Keith Rupert Murdoch March 11, 1931) is an Australian born media mogul and the founder, CEO and Chairman of News Corporation, one of the world’s largest media holding companies. Rupert Murdoch acquired various newspapers in the 1950s and 1960s. In 1969 he expanded his business into the United Kingdom, taking over two major British newspapers. In 1974 Murdoch moved to the United States where he soon became an American citizen. In the 1980s, he acquired Twentieth Century Fox and Harper Collins. In 2007, he added The Wall Street Journal to his holdings. He soon expanded into South American and Asian networks. By then, Rupert Murdoch owned more than 800 companies with a net worth of more than $5 billion. In 2011, News Corporation faced allegations of hacking the phones of royalty, celebrities, and other citizens. He also faced corruption and bribery investigations by the FBI. In 2012, Murdoch handed in his resignation as director of News International. Rupert Murdoch has six children. As of 2012, his net worth exceeds $8 billion. The Melbourne born Rupert Murdoch was a student at Greenlong Grammar School where he was first introduced to editing a news publication. As the editor of two school journals, Rupert Murdoch discovered his talent for journalism at an early age. In high school, he was a successful cricket player leading his school team to the National Finals. During his teen years he worked part-time for the Melbourne Herald and was also prepared by his father to take over the Murdoch family business. 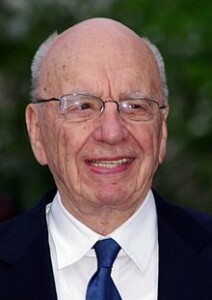 Rupert Murdoch attended Worcester College and the University of Oxford. He completed a M.A. and later became a co-editor for the Daily Express. After his father’s death, the 21 year old Murdoch took charge of the 1923 family established News Limited. He soon began directing his attention to expansion and acquisition of several Australian newspapers. In 1968 Rupert Murdoch acquired his first UK newspaper, News of the World, followed by the 1969 purchase of the struggling daily newspaper, The Sun, which he turned into a tabloid format. In 1997 The Sun attracted 10 million daily readers. In 1999, Murdoch acquired a leading Australian independent music label, Mushroom Records, which he later merged with Festival Records. The label, which was managed by Murdoch’s son, became Festival Mushroom Record. Murdoch’s first US acquisition was the San Antonio Express-News in 1973. Soon after, he founded the supermarket tabloid, The Star. In 1976, Murdoch purchased the New York Post. In 1985, Murdoch became a US citizen to satisfy the legal requirement that only US citizens were permitted to own US television stations. This caused Murdoch to lose his Australian citizenship. In 2011 Rupert Murdoch and his son James gave testimony before a British committee regarding phone hacking accusations. In the UK his media empire remains under fire as investigators continue to search reports of hacking phones of royalty and celebrities. Murdoch has been married to Wendi Deng since 1999 and they have two daughters.